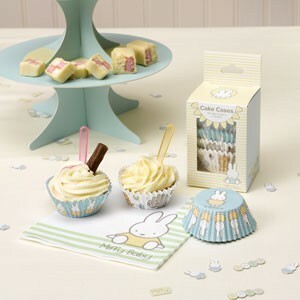 Beautiful cupcake cases, part of the ‘Baby Miffy’ range of table ware and party accessories. Designed with baby showers, christenings and first birthday celebrations in mind, this lovely range features the enduringly popular Miffy character, accompanied by some other animal friends. These cupcake cases will look lovely on your party table and are an easy way to jazz up your fairy cakes and other bakes. Each pack of 100 cases features two designs.